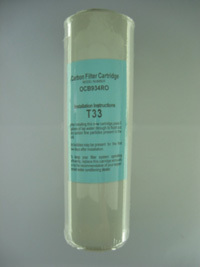 Omnipure T33 granular carbon cartridge for taste, odour, chlorine and chemical removal. Standard 10 inch cartridge. The T33 carbon type has a larger particle size and allows faster flow.